Today in Masonic History William Henry Barnum passes away in 1889. William Henry Barnum was an American politician. Barnum was born on September 17th, 1818 in Berkshire County, Massachusetts. Sometime prior to 1830, Barnum moved with his family to Connecticut, most likely to Salisbury where his father started the Barnum Richardson Company. In 1840, Barnum joined his father's company and would eventually be the Chief Executive Officer of the company. At the time Barnum joined the company they began making parts for the early railroad industry. Eventually they would become a leader in the railroad industry. In 1851, while living in Lime Rock, Connecticut, Barnum served in the Connecticut House of Representatives. He served one term. 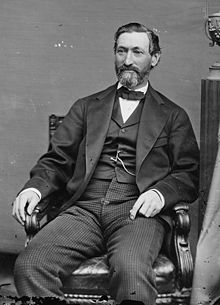 In 1867, Barum ran and was elected to the United States House of Representatives. During his time in the House of Representatives, Barnum with a partner would create the Ensign Manufacturing Company, a railroad freight car manufacturer. The company made high capacity box cars for the Central Pacific and Southern Pacific Railroads In 1876, Barnum resigned from the House of Representatives to take a seat in the United States Senate. He served there until 1879. At some point in his career, Barnum ran successfully for office against his third cousin, P.T. Barnum, the famous entertainer. Barnum was also one of the founders of the Barnum & Richardson Company with offices in Lime Rock and Chicago, Illinois. The company was immensely profitable and was a leading company in the production of metal products through out the world. Barnum, in 1883, became embroiled in a religious freedom controversy. Barnum who was Episcopalian was one of the few people in that area and in that time period who was still hiring Roman Catholics. As the story was told in the New York Times, Barnum made donations for the construction of a couple of Catholic Churches in the Lime Rock area. When locals became angry that a local Catholic priest had raised a crucifix in the community, they called on Barnum to fire all of his Catholic workers, he refused to do so. Barnum passed away on April 30th, 1889. Barnum was a member of Montgomery Lodge No. 13, Lakeville, Connecticut.